Hi Naomi here (with Sophie)! Welcome to the first, official week of Our Little Linky. After piloting it last month we will now be running the linky every week. Hosted by me (Naomi) and one of our linky team co-hosts. 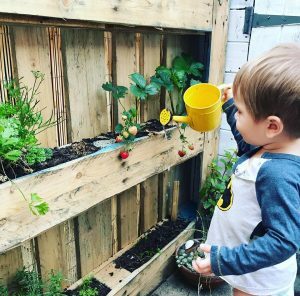 This week with Autumn upon us I’ll be linking up with a look back at our urban, summer garden. With help from the Kew Gardens Grow Start team, who donated all our seeds. Fondly referred to as ‘The Junk Yard’ Theon and I will be show casing how we turned our grotty North West slab into a blooming marvellous oasis. My featured article this week comes from Alan Herbert of omg family life food. Who’s article on the highs and lows of kids collectables and the ‘Blind Bag Phenomenon’, is an insightful, MUST read if your mini’s are approaching that age! Over to me (Sophie). With my favourite season finally making an appearance I thought it only appropriate to focus on autumn fashion. I’m going to be showing you the easiest ways to transition your wardrobe. Whether you’re looking to jump into your old comforts or head to the high-street for the latest trends. Get ready to step into the new season in style. Preferably in a shade of burnt orange. My feature article this week comes from Nicole France and her blog ‘this blonde mind’ her article on the mule shoe is not only funny and effortlessly stylish but also insightful if like me you’re on the edge of ‘should I, shouldn’t I’ on this years mule shoe trend. I like that vertical growing plants station, it looks really great. Thanks, the hardest part was sourcing them. The actual putting them up was relatively easy and they’ve been really great both practically and aesthetically! 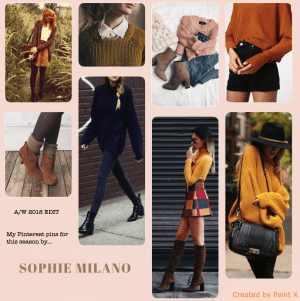 Burnt orange is one of the best colours of this season, that and a deep cranberry, I can’t wait to get out my jumpers again as well!! I may just have to go out and buy some more jumpers myself – the wardrobe full I have is never enough especially when they keep bringing out such lovely designs and colours!